It’s been a wild 30 days for home affordability. Since the Federal Reserve’s November 3 press release, in which our nation’s central banker committed $600 billion to bond markets, mortgage rates have leaped, moving quicker than the news can report them. This week is a terrific example of that. Today, newspaper headlines in New Hampshire and around the country read that mortgage rates rose 0.06% on average over the past 7 days, and that average loan fees remain unchanged at 0.8 points. The data is based on Freddie Mac’s Primary Mortgage Market Survey, a weekly poll of more than 100 lenders around the country. Unfortunately for home buyers and other local rate shoppers, the Freddie Mac figures are low. Both mortgage rates and fees rose by more than what’s being reported. Freddie Mac’s data is not real-time. It’s out of date for today’s pricing. According to Freddie Mac, the survey’s methodology has it collecting rates from participating lenders between Monday and Wednesday, averaging the results, and then publishing that data Thursday late-morning. The problem there, as you know if you’ve shopped for a mortgage rate, is that mortgage rates change all day, every day. Monday’s rates are unrelated to Wednesday’s rates, yet both are included and given equal weight by Freddie Mac. Some weeks, it’s not a problem; rates are relative static. This week was not such a week. Rates were jumpy Monday and Tuesday, rising and falling throughout the course of the day. Action like that is normal. But Wednesday, mortgage bonds put forth their third-worst daily showing of the year. Rates rose by as much as 3/8 percent between the market open and close, with the bulk of the sell-off coming late in the day. In other words, after the deadline of Freddie Mac’s survey. Mortgage lenders accurately reported their rates to Freddie Mac, but they reported them before the market turn a turn for the worse. The lesson is that mortgage rates are time-sensitive and can’t be captured by a weekly, average survey. When you need to know what mortgage rates are doing right now, the best place to check is with your loan officer. 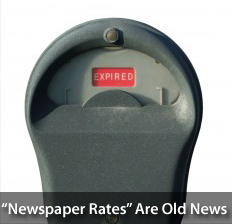 Otherwise, you may just get yesterday’s news. Rock-bottom mortgage rates may be gone for good. This week’s Freddie Mac Primary Mortgage Market Survey shows in numbers what Massachusetts rate shoppers have learned the hard way — mortgage rates are spiking. Unfortunately, for home buyers and rate shoppers , it also leads to rising mortgage rates. The days of 4 percent, 30-year fixed rate mortgages may be nearing its end. If someone is thinking of buying and considers the impact of rising rates on his budget, it could help spur some offers from those sitting on the fence. If rates stay low, two things can happen. One, you give your end buyers more opportunity to purchase a home. Two, it takes away the urgency to buy now, because there is less fear of rising rates. Buyers know we are headed toward winter, and that they are in the driver’s seat, so price the home properly. Properly doesn’t mean – “I might get this for it, so I’ll try for a few weeks.” Properly means the lowest price compared to similar homes, or the best home compared to similarly priced houses. The recent rise in mortgage rates was slowed this week after the government released its Retail Sales report for August. Prior to Tuesday, mortgage rates had been spiking across New Hampshire on the resurgent hope for U.S. economic recovery. The sentiment shift was rooted in reports including the Pending Home Sales Index and Initial Jobless Claims, both of which showed surprising strength last week. August’s Retail Sales, though, after removing motor vehicles, auto parts and gasoline sales, failed to maintain the momentum. Its figures were actually in-line with expectations — it’s just that expectations weren’t all that high. Wall Street now wonders whether the weak Back-to-School shopping season will trend forward into the holidays. The doubt spells good news for mortgage rates and home affordability. 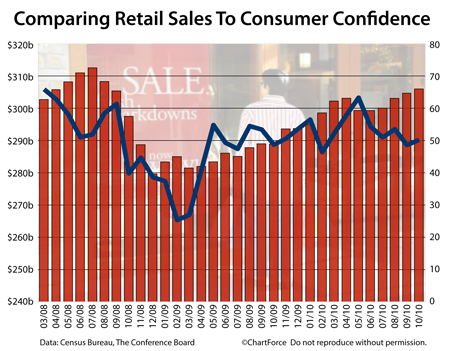 Because Retail Sales is tied to consumer spending and consumer spending accounts for two-thirds of the economy, a weak reading tends to drag down stock markets and pump up bonds, and when bonds are in demand, mortgage rates fall. This is exactly what happened Tuesday. The soft Retail Sales data eased stock markets down, and generated new demand for mortgage bonds. This demand caused bond prices to rise, which, in turn, caused mortgage rates to fall. Mortgage rates did not cut new lows this week, but they’re very, very close. With mortgage rates at historical lows, it’s an excellent time to look at a refinance, or gauge what financing a new home would cost. Low rates like this can’t last forever. Your ARM Is Adjusting Lower. Is There A Downside To Letting It? I found the information below to be interesting. It applies to conventional homeowner financing but it’s good to have some insight as to what’s going on in the end-buyer finance market. If you are selling a rehab, low rates give your end buyers a reason to buy now. When adjustable-rate mortgages are on the verge of adjusting, a common concern among homeowners is that their mortgage rates will adjust higher. Well, this year, because of the math of how ARMs adjust, homeowners around the country are seeing that mortgage rates on ARMs can sometimes adjust lower, too. 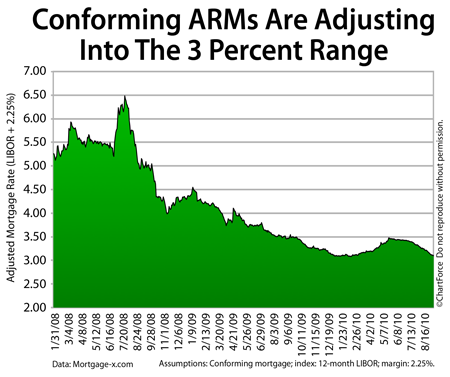 Adjusting conforming mortgages are adjusting to as low as 3 percent. 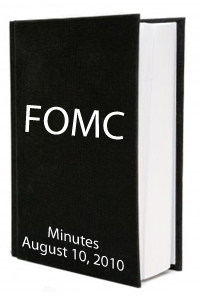 There’s a “starter period” in which the interest rate remains fixed. This can range from 1-10 years. There’s a rate change after the starter period. It’s called the “first adjustment”. 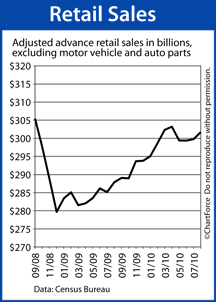 Subsequent, annual adjustments follow until the loan “ends”. This is usually after Year 30. The adjustments each year are based on a math formula that’s included in the contract with your lender. It’s surprisingly basic. Each year, your new, adjusted mortgage rate is equal to the sum of some constant — usually 2.25 percent — and some variable. The variable is most commonly equal to the 12-month LIBOR. LIBOR is an acronym standing for London Interbank Offered Rate. It’s an interest rate at which banks borrow money from each other — very similar to our Fed Funds Rate here in the United States. And also like our Fed Funds Rate, LIBOR has been low lately. 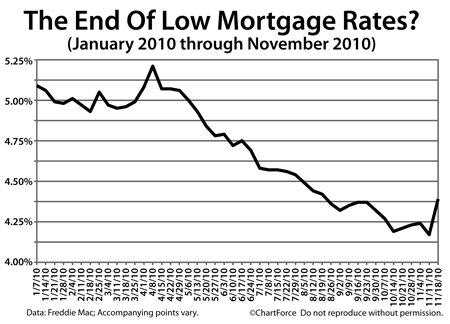 As a result, adjusting mortgage rates have been low, too. In 2009, 5-year ARMs adjusted to 6 percent or higher. Today, ARMs are adjusting to 3.000%. Based on the math, you may want to let your ARM adjust with the market year. Or, if you plan to keep your home long-term and have concerns about adjustments in 2011 and beyond, it may be a good time to open a new ARM. The same forces that are driving down LIBOR and helping to keep mortgage rates low overall, too. Consider talking to your loan officer and making a plan. With mortgage rates as low as they’ve been in history, most homeowners have options. Just don’t wait too long. LIBOR — and mortgage rates in general — are known to change quickly. We’re entering the Fall season – anyone buying a home now doesn’t want to move during snow, or at Thanksgiving. They want to get settled before the Holidays and before bad weather. So right now you have the largest pool of potential buyers that you are likely to have for the rest of the year. Mortgage rates are low right now but pinning them down this week could be a challenge. As Labor Day Weekend nears and Wall Streeters take their head-start on the holiday, trading volume will fall, which will cause mortgage rates in New Hampshire to get jumpy. Mortgage rates may rise this week, or they may fall. Either way, if you have a buyer, they will want to lock as soon as possible. Rates are at all-time lows and likely won’t last.